You and your pals are playing too many videogames, and Mom said it’s time to go outside for a bit. Little does she know the dangers spawning outside in Neighborville. Portals open up from another dimension. Evil robots, dragons, wizards, and zombie Abe Lincolns burst out from these portals and start attacking you and your pals! Luckily, you have your trusty wooden sword and your pal saved some bottle rockets from 4th of July. How is that going to help? Use your imagination, kid! Each night you'll unlock more of the 40+ crazy toys to add to your arsenal and become a more powerful team by choosing from 40+ game-changing superpowers. Break open presents found around the map to find the rad weapons you've chosen. Blast bottle rockets at evil dodgeballs. Blow a bubblegum-shield to protect your team. Catch the incoming robots on fire with your hair dryer flamethrower. Smash a wizard's face off with your trusty wooden sword. Dash around as flames blast out from your feet with the new "Hot Feet" superpower you just picked. Can you defeat the bad guys before bedtime? Stay in the Friend Zone! 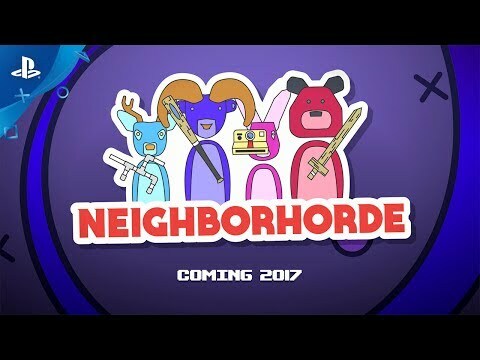 Neighborhorde doesn't fake the cooperative team experience either; you will really have to communicate and work together to stay alive. Staying close to your team in the "Friend Zone" is the only way you'll regain your health. Since there are 80+ weapons and superpowers, and tons of enemies, no game is the same as the last and you’ll always have a new strategy to try. Find the best combinations of superpowers and toys to prevail over the horde.